Hours:	Mon.-Wed. 11 a.m.-10 p.m.; Thu.-Sat.11 a.m.-11 p.m.; Sun 11 a.m.-7 p.m.
Who doesn't love a nice, cold beer? Well, Jason, for one. But he does love carbs in almost all their other forms, with special mention given to sausage and potatoes. So he's down with the other half of the formula for a beercentric restaurant -- i.e., a huge and eclectic selection of imported beers + microbrews + light German-inspired menu (or is that an oxymoron?) = sounds good, when do we go? Barley's & Hop's brings this formula to the South Hills in a retail slot at the South Park Shops. In this rather sterile setting, owners Tim Santoro and Ray Messmer have striven to create "a cross between a German Biergarten and a New Orleans-style coffeehouse (hold the coffee)" -- a casual, personable atmosphere where the beer is always flowing, the game is always on and someone is always ready to hang out. The retail-grade fluorescent lighting works against any coziness quotient, but the tables are built on barrels, the walls are lined with shelves of beer, and the back corner is furnished with cushy couches and chairs and a wall lined with the personal mugs of the "Mug Club." The staff was welcoming, and while our server was very knowledgeable about the beer -- especially the "lucky 13" on tap -- we were there to try the food. German food, to be specific. While most bottle shops focus on all-American pub grub like nachos and pizza, Barley's & Hop's distinguishes itself with a short, mostly Teutonic menu, from soft pretzels and cheese plates to "The Best Wurst." We never let a pun, no matter how painful, stand between us and cold cuts. The meat-and-cheese platter nearly overflowed the cutting board on which it was served, with big hunks of cheddar, Swiss and havarti dill, plus summer sausage, pepperoni and ring bologna. Perhaps not exactly what you'd get in München during Oktoberfest, but copacetic choices nonetheless. Our main quibble was with the decision to include kalamata olives, when some sort of pickle would have been a far more authentic and harmonious choice. The platter was served with crackers, but we also tried a more traditionally German soft pretzel. This was warm, soft and deliciously doughy with good, grainy golden mustard. One of Barley's & Hop's few concessions to American bar food, wings, were described on the menu as grilled, but we wouldn't have known it from our serving. The garlic wings were literally bathed in garlic butter; Jason couldn't help but think of lobster. The meat was nearly that succulent, but the garlic flavor was redolent of garlic salt, with the emphasis on the salt. By now it was time for the main event: sausages. 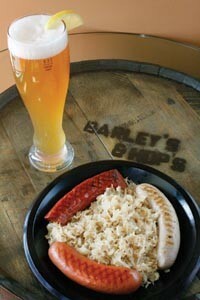 The wurst platter consisted of our choice of three sausages on a bed of sauerkraut. Of the five sausages on the menu -- bratwurst, knackwurst, Polish and Slovenian kielbasas, and the decidedly un-Germanic Cajun brat -- we selected knackwurst, Slovenian kielbasa and Cajun. The two traditional sausages were beautiful, plump little tubes, served in their natural casings with the ends knotted. The knack was mild but snappy with a smooth texture, while the Slovenian kielbasa -- which Jason generally finds less harsh than Polish -- was hearty yet almost refined, with a medium grind and a garlic bite that didn't overwhelm the meat. The Cajun had no such reservations, however, announcing its spice at once. Still, it wasn't mere heat for heat's sake: The beef, garlic and chili flavors, brash as they were, played off one another in well-modulated harmony. The sauerkraut was traditionally Bavarian, with caraway seeds and some sweetness. A side order of German potato salad was suitably warm and vinegary, and appeared to be accented with bits of wurst rather than the traditional bacon. One more sausage was in the offing: the venerable, if humble, frankfurter. A good, honest natural-casing dog, it came in a roll that evoked, without quite duplicating, the marvelous, crusty little breads in which Germans serve their wursts. 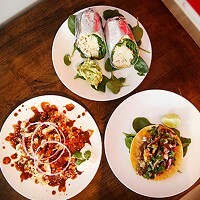 For the odd beer-lover who might be disinclined toward German food, Barley's & Hop's offers some classic American deli fare, such as chili and wraps. Angelique's buffalo-chicken wrap was an expertly assembled package of moist, slightly spicy chicken, tender greens, sharp cheddar and tangy blue-cheese dressing in a sun-dried tomato tortilla. As an accompaniment to beer, it was as satisfying as if the Germans had invented it themselves. For beer connoisseurs and anyone looking for a warm place to meet and eat -- and drink -- with friends, Barley's & Hop's is an oasis of German-style Gemütlichkeit in South Hills suburbia.